SECAUCUS, NJ (March 7, 2010) - Panasonic today introduces a new interchangeable lens for its LUMIX G Micro System, the ultra-compact and lightweight LUMIX G VARIO 14-42mm/F3.5-5.6 ASPH/MEGA O.I.S. lens offers versatile zoom range of 14-42mm (35mm camera equivalent: 28-84mm), making it suitable for a wide variety of scenes, everything from dynamic landscape to portrait. The LUMIX G VARIO 14-42mm/F3.5-5.6 ASPH/MEGA O.I.S. lens will be part of the kit lens for the latest additions to the LUMIX G Series of digital cameras: the LUMIX DMC-G10 and LUMIX DMC-G2, also introduced today. 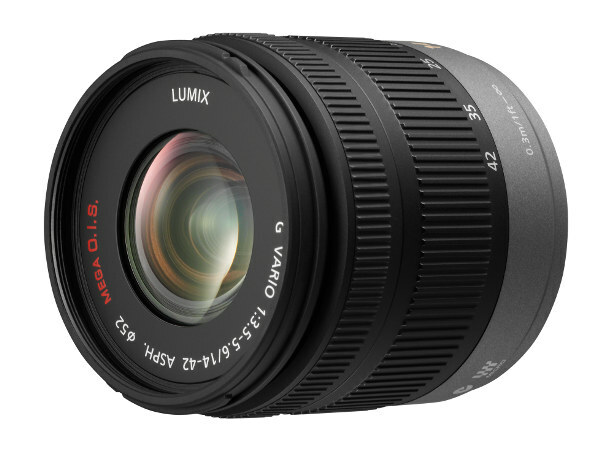 The new LUMIX G VARIO 14-42mm/F3.5-5.6 ASPH/MEGA O.I.S. lens incorporates Panasonic's MEGA O.I.S. (Optical Image Stabilizer), which makes it easy to shoot clear photographs, even in low-lit situations, by suppressing the blur caused by a shaky hand. Adopting an inner-focus system driven by a stepping motor, the superior optical design realizes outstanding smoothness to support the high-speed AF (Auto Focus) system of LUMIX G cameras. When mounted on any of these cameras, this new lens allows users to maximize all of the AF system's functions. With its minimum focus distance of 30cm even at full zoom, this lens provides a maximum photographic magnification of 0.32x (35mm equivalent). Seven aperture blades make up a circular aperture diaphragm to produce an attractive smoothness in out-of-focus areas even when shooting at a large aperture. The LUMIX G VARIO 14-42mm/F3.5-5.6 ASPH/MEGA O.I.S. lens system uses multi-coated lens elements that reduce blur, helping to deliver superior performance. This new lens system also features excellent contrast even at its highest zoom level. The inclusion of an aspherical lens improves optical performance by minimizing distortion, even at the 28mm wide end. For more information on the Panasonic LUMIX G Series digital cameras, lenses and accessories, please visit www.panasonic.com/lumix. Based in Secaucus, N.J., Panasonic Consumer Electronics Company (PCEC), is a Division of Panasonic Corporation of North America, the principal North American subsidiary of Panasonic Corporation (NYSE: PC) and the hub of Panasonic's U.S. marketing, sales, service and R&D operations. In its commitment to provide consumers with extensive imaging resources, Panasonic LUMIX established the Digital Photo Academy, a series of nationwide workshops designed to instruct consumers how to optimize the features on their digital cameras and produce high-quality photos. Panasonic is pledged to practice prudent, sustainable use of the earth's natural resources and protect our environment through the company's Eco Ideas programs. Company information for journalists is available at www.panasonic.com/pressroom. For more than 20 years, Panasonic has been proud to support the Olympic Movement as an Official Worldwide Olympic Partner in the Audio and Visual Equipment category and, beginning in 2009, in the Digital Imaging category as well. Panasonic has also renewed its partnership with the International Olympic Committee for an additional eight years through the 2016 Summer Games. For more information, visit http://panasonic.net/olympic/.